Starring: Spike Lee, Danny Aiello, John Turturro, Giancarlo Esposito, Ossie Davis, Ruby Dee, Rosie Perez, Richard Edson, Bill Nunn, Samuel L. Jackson, Paul Benjamin, Frankie Faison, Robin Harris, John Savage, Joie Lee, Miguel Sandoval, Rick Aiello, Roger Guenveur Smith, Frank Vincent, Martin Lawrence. 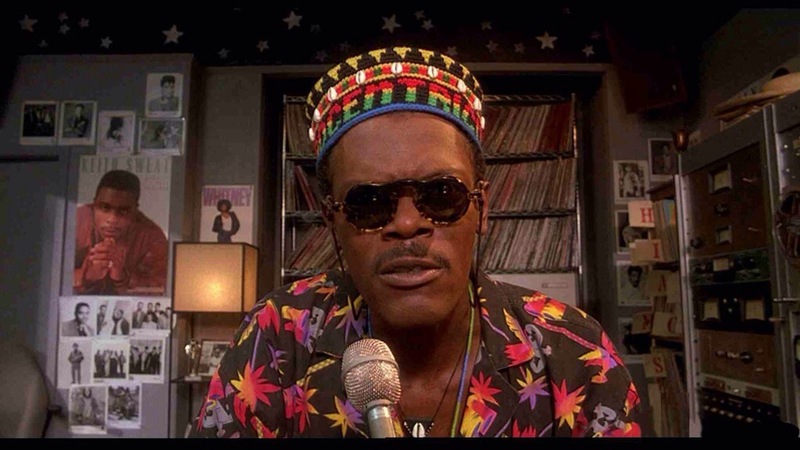 Remember the days when Spike Lee’s “joints” has a real edge and potency to them? Nowadays, he’s rolling out more generic, Hollywood tripe like “Oldboy” but there was a time when he was a highly original and passionately political filmmaker as he regularly touched upon important social issues and conflicts. 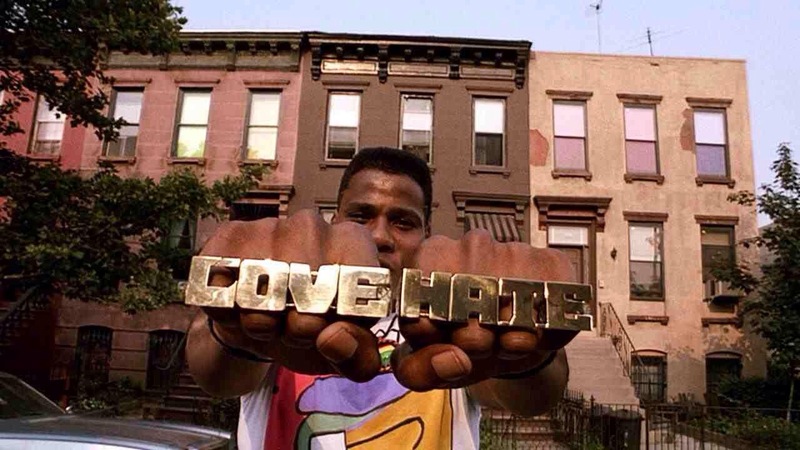 However, few of his joints have been as packed or as provocative as “Do The Right Thing“. On a hot summer day in a Brooklyn neighbourhood, the residents struggle to keep their cool in the increasingly sweltering temperature. 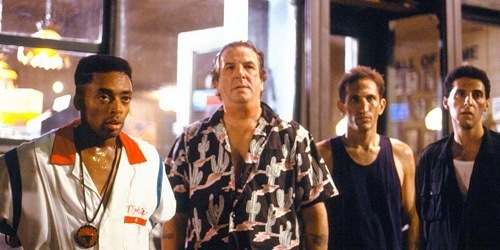 Sal (Danny Aiello) owns the local Italian pizzeria where he happens to upset black activist Buggin’ Out (Giancarlo Esposito) who, in turn, demands the black community boycott his place. Most people are unwilling to do so but it still adds to the discontentment amongst the community as racial attitudes and prejudices begin to surface. 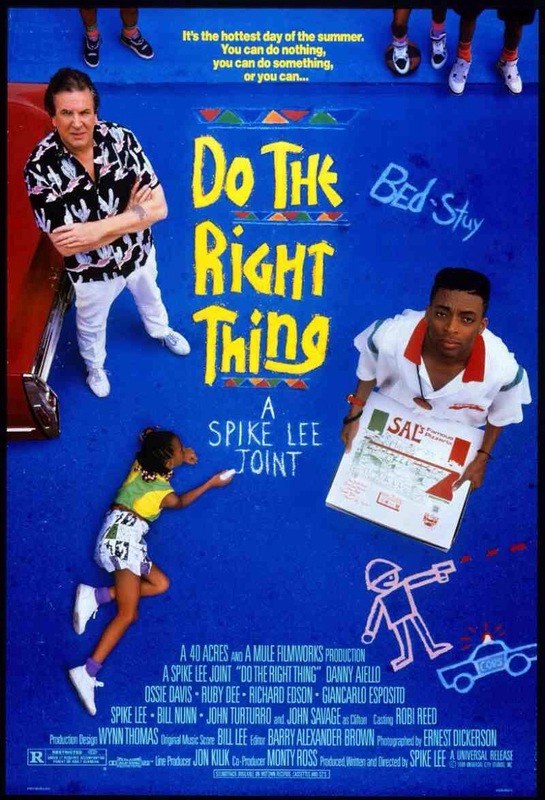 Taking the title from Malcolm X’s quote “You’ve got to do the right thing” and being inspired by an actual incident in Howard Beach, New York, Spike Lee crafts an important and unflinching portrayal of racial tension in a literal urban melting pot. He sets his intentions from the outset with the ferociously pumping music of Public Enemy’s “Fight the Power” and infuses his story with an eclectic mix of races, characters and personalities, while still managing to lend the film an important lightness of touch. It has a distinct and observant humour that magnifies the absurdity in people’s preconceptions and judgments but this absurdity is soon, skilfully, shifted to frustration and rage which descends his characters into a chaotic madness. Filled with an abundance of excellent performances from Danny Aiello’s hard working Sal to John Turturro as his racist son Pino and a small but highly entertaining role for Samuel L. Jackson as the radio dj ‘Mister Señor Love Daddy’ – who seemingly oversees everything in the neighbourhood. Lee’s direction is vibrant and colourful and makes full use of an excellent hip-hop score before other filmmakers realised it was even cool to do so. His script is also as sharp as they come; it has endlessly quotable dialogue and he even has the bravery to have a selection of characters – from different ethnic backgrounds – rhyme off very personal and racial slurs in a montage that breaks the fourth wall. With this scene alone, it’s easy to see why some were offended by the film upon it’s release. It’s a passionate reflection of racism and race relations and one that raises as many questions as it answers. However, that’s the whole point; Lee’s agenda is not to incite trouble but to rouse debate and he does a sterling job in doing so, while still being empathetic towards each and every one of his characters – regardless of their ethnicity. That’s the real key in preventing this film from being contradictory in it’s arguments as some critics have claimed it to be. Few films have ever dealt with racism as powerfully or as thought provoking as Lee does here. He has a strong voice on the subject and this outstanding piece of work is one that’s still as relevant today as it ever was. Beginning with a simmer before ending in a boiling intensity, this is a powerful and thought provoking, sociopolitical commentary. Lee would go on to deliver the similarly themed “Jungle Fever” and “Malcolm X” after this, which cemented his reputation as one the most important black filmmaker’s of our (or any) generation. Trivia: Spike Lee originally wanted Robert DeNiro for the role of Sal but DeNiro turned it down, saying that it was too similar to many of the parts he had played in the past. In the end the part went to Danny Aiello. This entry was posted on May 8, 2014 at 9:55 am and is filed under Comedy, Drama with tags 1989. You can follow any responses to this entry through the RSS 2.0 feed. You can leave a response, or trackback from your own site. Easily Spikes best film from the ones i’ve seen. I love these gritty films that seem like they could be real. Love these type of films myself. I was a massive fan of Lee’s films in the past. I’d say it’s a toss-up between this and Malcolm X as his best. Two fantastic film. Nice work Mark. A great film and one I haven’t seen in ages. Nice to see Jungle Fever get a mention too – two really interesting takes on what is essentially the same subject. Have you seen Summer Of Sam? Cheers Stu. It’s a fantastic film as is Jungle Fever. Love them both. I have seen Summer of Sam but it’s been a very long time. I remember liking it but it didn’t go down well with many. Yeah I remember it getting some fairly bad reviews. I really liked it though. Anyway – back to Do The Right Thing…it’s a shame he’s lost this kind of edge really. Maybe he’s better when he works with big casts. I quite liked Inside Man but Oldboy was dreadful and both of them really don’t have that edge that Spike was so well known for. It is a shame. I’d love to see him do something like this again. He was top class at one point. I loved this movie. I miss the old Spike. Yeah, man! Bring back the old Spike. All is forgiven. Another great review on something I haven’t seen yet, Mark. I think the only Spike Lee film I’ve seen is Inside Man. This one seems to be highly praised though, I might give it a shot as some point. I have zero interest in seeing Oldboy though, I read your review and you’re not keen on that one either, right? Yeah, forget Oldboy, Ruth. It’s not worth your time. Spike’s older films are fantastic, though. This and Malcolm X are superb. Two of his very best. Thanks a lot Ruth. I upvoted. I reddited it the other day but didn’t get much luck. This movie still sticks in my mind, up until this day. Very disturbing, yet, also totally blunt and honest. 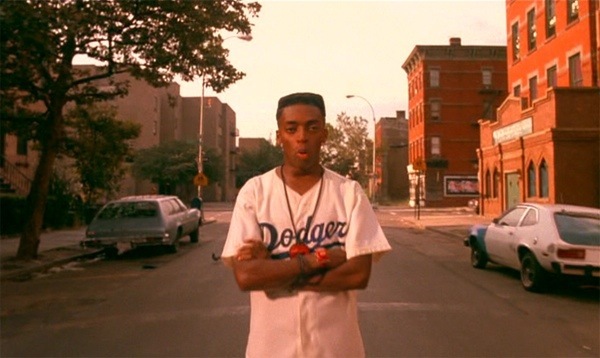 Probably one of the best examples of Spike Lee doing both and pulling it off effectively. Good review Mark. Cheers Dan. Blunt and honest are two words that best describe this. A marvellous piece of work and still relevant today. Fantastic. Both this film and your review, Mark. What a way to end the 80s, too. Thanks again, Eric. Such a great movie. Powerful, powerful stuff and, yeah, what a way to the decade. This rightly put Spike on the map! Thanks for reviewing this. It is one of my favorite movies of all time. It just encapsulates everything good and bad about the New York I grew up in and unabashedly goes for the jugular. Cheers Wendell. I’ve been meaning to get a review done if this for quite some time. Managed to see it again last week and it’s still as powerful as it was when I first seen it. Great movie. Much obliged, miss! I hate this time of year for movies as there’s just too many Hollywood blockbusters on show, so it gives me the time and incentive to go back to older films and review them instead. I love this movie, though. One of Spike’s very best. Yes there is nothing great out right now. I love watching all the movies I own or know I loved, it doesn’t get much better and the movie seems to fly by really fast. We will see but Spike Lee doing a Showtime series sounds very intriguing! It does sound intriguing. I’d love to see him get passionate about something again. PS… I heard Spike Lee is making a series for Showtime out of his 80’s movie, She’s Gotta Have It.. wonder if it will be any good! That’s interesting. I’d never heard about that before. I’ll keeps eyes peeled. Here’s hoping it works. Great film, and a great post… keep up the good work! Nice review. I remembered we talked about this a bit in your post about Oldboy. This is my favorite Spike Lee movie and one of my favorite films ever. Out of curiosity, what kept it from you giving it a full five stars? Yeah, after we chatted, I dusted down my copy and put it on. It had been far too long since I’d seen it. It’s certainly an outstanding piece of work. I never gave the full five stars as there was a couple of moments where I found that it ground to a halt. These were namely the scenes with Rosie Perez. I didn’t find it all that important to the narrative and slowed the film down unnecessarily. It’s a bit harsh, I know. Otherwise is five stars all over the place. Wonderful work sir. Wow, this was such a game changer. It’s a shame Lee’s subsequent joints never reached the same heights. Thank you sir! You’re spot on, man. It certainly was game changer and I’d love it if Spike lit up another one these bad boys again. He seems to have lost his passion a little. Superb review. I tip my hat. I love this movie so much. Malcolm X is one of my favourite bios too. Cheers Alex. It’s a fabulous film. No question. It was great to see it again after so many years and it still stands up. I’m planning on catching Malcolm X again too, at some point. Another great great film by Spike. Sorry for the late reply, Vern but thanks all the same buddy. I could have sworn you’d commented on this already but I must have getting mixed up with another post. Thanks again for your kind words, Veronika. I really appreciate that. You’ll notice some of my older reviews are very lazy but I’ve been putting in a bit more effort over the last couple of years. Glad to hear you’re a fan of this one. It’s a fabulous film and possibly Lee’s best. Although, I too have to rewatch a few of his earlier films. He used to be on fire at one point. No worries, all I’ve read so far was great! 😉 And I think we all become better at writing reviews over time, I’m also not very proud of my oldest posts. Yes, definitely, this is Lee’s best work to this date. And I like most of his films, but he seems to have lost the spark/fire/edginess that I so admired in his earlier films. I’ve sensed a bit of it in his latest film Chi-raq, though. I’m looking forward to Chi-raq. The buzz surrounding it is quite positive so far.